You don’t necessarily have to lose your teeth as you age. Regular oral hygiene will go a long way in preserving your oral assets; mainly gums and teeth so that you can smile and eat with them throughout lifetime.However, despite your best efforts, and sometimes due to factors outside your control gum disease can set in. If not treated, it can hasten the loss of your teeth. That is why regular dental visits are important even if you have no dental complaints. A dental professional will be able to detect any early signs of gum disease. If your dentist finds any signs of gum disease, he or she may recommend periodontal therapy, or gum treatment. While gum therapy may take different forms, the purpose is always to restore the health of your gums. Periodontal (gum) disease can start due to bacteria growing in dental plaque and causing gum inflammation. If unchecked, the disease can loosen the gum tissue over time. 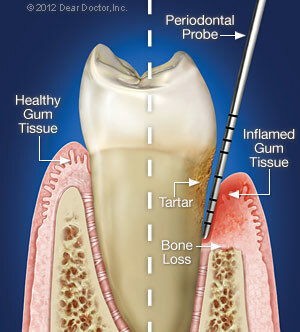 In advanced periodontal conditions gum and bone tissue holding the teeth is damaged and teeth may ultimately be lost. Treatment procedures will depend on the gum condition being treated. These can range from simple cleanings and root-planing to surgery and grafting of gum and bone tissue. Scaling and Root-Planing- These are called deep-cleaning techniques. These are the best starting point for treatment and control of gum disease. Plaque and tartar (hardened calculus) are removed from under the gum tissuemanually using hand scalers, and/or using ultrasonic instruments. Gum Grafting-When gum or bone tissue has already been lost it can be replaced by grafting. Suitable tissue is ‘harvested’ from another part of the mouth, usually, the back of the palate, and applied where required. The graft soon integrates with the original bone structure. Graft material may also be obtained from a tissue bank which may be natural and synthetic. Such tissue has to be lab treated to make it acceptable to the body tissue. Periodontal Plastic Surgery-Plastic surgery actually means surgical procedures for reshaping tissue and bone contours primarily for aesthetic purposes. Periodontal Laser Treatment-lasers can also be used for periodontal treatment as alternative to conventional surgery. This will normally offer much less discomfort and cause less gum shrinkage. Crown Lengthening Surgery- Thiskind of surgical procedures is employed in case a tooth structure is covered by gum and bone tissue needs to be exposed. The reason may be purely cosmetic (longer teeth-smile becomes less gummy), or to aid in fixing a new dental crown. Dental Implants-If gum disease has progressed beyond treatment, the failed teeth need to be extracted and replaced with prosthetic teeth. Dental implants are the modern means of getting replacement teeth and dentures. A titanium post is screwed into the jaw bone under the gum flesh. The jaw bone gradually integrates with the metal to form a strong bond. A real-looking tooth crown is then placed on to this post to give the patient a replacement tooth which is almost like a natural tooth. Your role in preventing gum disease in your mouth is crucial. The basic cause of gum disease, and indeed most dental problems is un-cleaned plaque. If you maintain good oral hygiene, chances of plaque formation leading to gum disease are reduced. Brushing twice a day and flossing is the best contribution you can make. However, there is another very important duty to your teeth. You must visit the dentist at least twice a year for inspection even if you do not have any dental complaints. Along with these routines, it is good to eat a nutritionally balanced diet with low sugar content. Abstention from tobacco will increase your chances of continuing to smile with your natural teeth.